What Happened December 6 and 22, 2012 in Daraya? An event those powers didn't include in their growing list, and still won't tell you about, happened one day earlier than this first widely-known CW attack, with the same death toll of seven. In fact, it seems kind of like the Homs incident was cooked up to distract from or shift the implications of this preceding event. These 7 bodies tossed across Obama's red line without note were Syrian Arab Army soldiers. Back then I created the ACLOS page Alleged Chemical Attack, December 22, 2012. There's not much details to share, so it's all included below and then some. On December 6th there was the first claim of CW use that I ever noticed (ACLOS page), coming just after Obama's December 3 re-iteration of his "red line" threat/offer (the first instance I had noticed - I didn't know he'd said it already in August). It was just three days later that the threat was snubbed or the offer taken, at least tentatively. And it was in Daraya, southwest Damascus suburbs, where reports came in of poisonous gasses "thrown" by government forces engaged there. This was from the well-connected Local Coordinating Committees, with no details and no word on casualties (presumably no deaths). Times of Israel reported on these claims December 7, citing the LCC report with no more detail, but supporting it claims from a supposed CW defector. 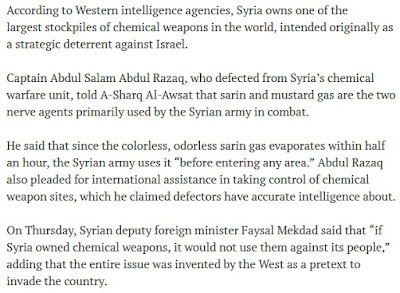 Captain Abdul Salam Abdul Razaq is cited telling a Saudi paper that Syria was already using mustard gas and sarin (both described as nerve agents) routinely, using sarin to clear any area before entering (since it was odorless, not foul-smelling, and evaporates in 30 minutes...). This logic-impaired Wahhabi activist "also pleaded for international assistance in taking control of chemical weapon sites, which he claimed defectors have accurate intelligence about." Anyway, no deaths or details, like who if anyone was even affected, were ever reported. So the December 6 incident is a fairly weak claim itself, and we're done covering it. <Insert, 2018> Did they really call in a CW attack but have no one die? Or did they have someone die, and then just not pull it together? After noting finally the not-pulled-together incident of November 30 in Daraya, with 3 men killed in bizarre fashion, listed by the VDC as random shelling deaths, I decided to re-check for any tentative CW martyrs there a week later. All Daraya martyrs on Dember 6 = one. And it so happens that was a baby who died from breathing things, with no wounds. 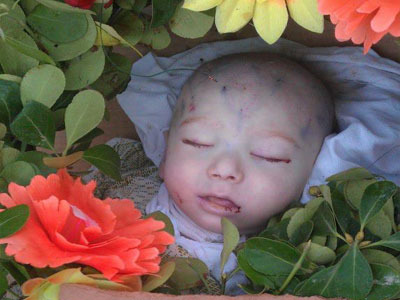 Mohammad Ali al-Khouli, from Daraya, killed by "other." 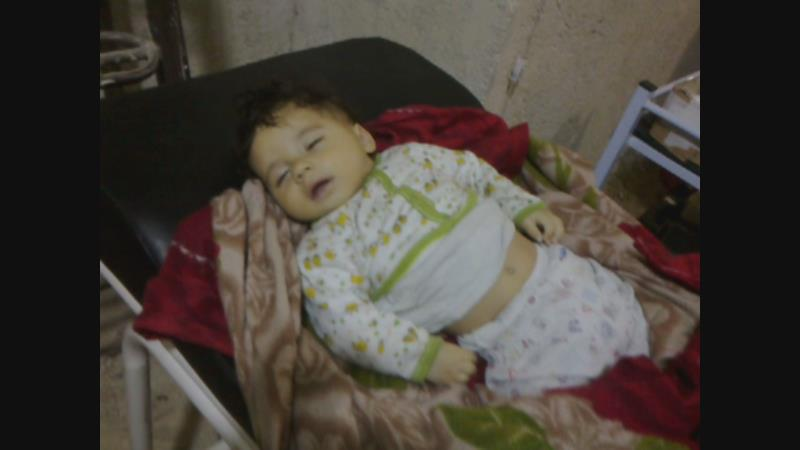 Notes: "months old 9 , was martyred due to suffocation by the smoke from shells." It was not, as they decided, from the toxic gas allegedly launched there the same day. I'm not so sure it's a coincidence. There's a photo, shown below. His eye may be damaged, swollen, seem raw along the edges of the lids. Is this nine months old, or younger? He has red hair by the eyebrows, but his head seems abnormally bald. I see zero hair. Was he undergoing chemo, that doesn't effect the eyebrows? Or was his head shaved very recently, or am I just wrong? I'm not sure what, if anything, those blue spots on his head mean. They look like varicose veins maybe, but some have sharp little black dots, like poked holes associated. Some minor facial wounds, eyebrow area, jawline - crusted blood from the mouth, perhaps some yellow stuff on his lower lip? Blood in the corner of one eye? From the eye, or the airways? Was that baby "displaced," as single children dying from chemical incidents in these days usually were? Perhaps. Khouli is not usually a Daraya name. VDC lists 61 Khoulis killed, 31 listed as from Misraba, some distance away in Eastern Ghouta, in fact right next to Douma. 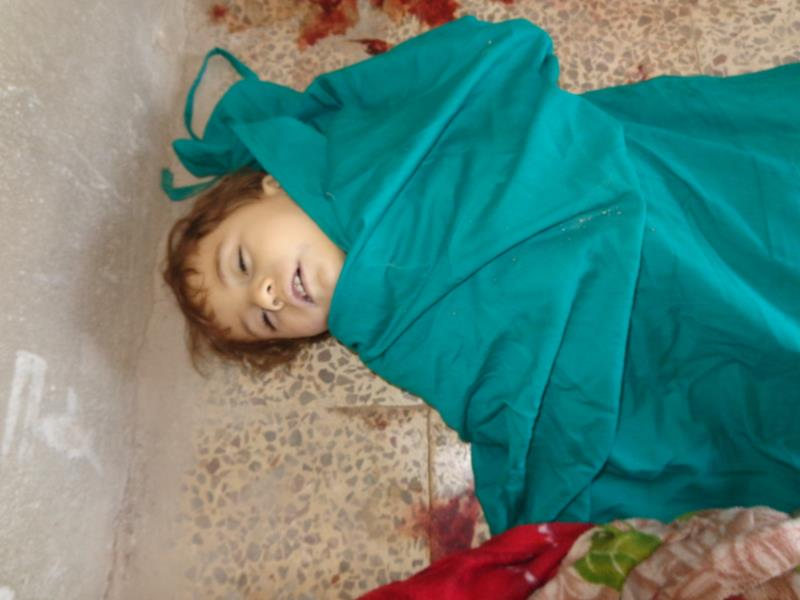 Only one other is listed as from Daraya - Mahmoud, killed 6 days later by random shelling "on Abu Bakr mosque". The only fatality to be the baby's possible father, by names, is Ali al-Khouli, from Misraba, an FSA fighter, age 43, killed by random shelling 5 months earlier, back on July 8. It was a bad 2 weeks for FSA fighters named al-Khouli - he's just one of 3 killed between 7-8 and 7-21, the others (from other areas) killed by shelling, unexplained execution. And in that same span, a civilian man with the same name as the baby: Mohammad Ali al-Khouli, civilian, from Misraba, was killed by unexplained shooting. Closer to the baby's murky deaths, five civilian men named Khouli were killed at once in Misraba on December 3, mostly by shelling. One was shot. All this could mean nothing, but seems worth noting. But searching those words, I found an active video claiming to show the same: " Damascus Darya use of toxic gases 5-12-2012"
But that's not to say it was based on nothing. It does have chemicals used, apparently in some response to Obama's renewed offer, and the people with possible plans to cross the red line were in Daraya, which rings likely considering the following. December 22: Soldiers Killed by Terrorist Use? A later OPCW report (a revised version only, available via Zanders blog and now ACLOS) mentioned this incident being reported by the Syrians, sort of a side note from the past. The details they share in their report are exactly the same. This strangely adds almost exactly nothing to what we already knew. Is that all the Syrians handed the OPCW, or is it just all they shared with us? But coming later, from the government, that death toll should be updated to reflect the final count, if the first reports didn't. But it's still 7, with no delayed deaths added later. That's noteworthy. There's no further mention of the December 22 incident in the OPCW report; it seems they didn't investigate it. But after noting it, they did bother to explain in the other cases, "those affected in the alleged incidents may have, in some instances, been exposed to some type of non-persistent, irritating substance" (like chlorine) and in one case (Daraya, Feb. 15, 2015) exposed to a "sarin-like substance." It's not spelled out, but between possible inclusion and implied exclusion, they suggest the December 22 attack was likely by chlorine or some similar in action, and not by sarin. This makes it seem a bit less interesting than it perhaps deserves to be. In fact, those 10 irritant cases tend to NOT be chlorine attacks as presented (see big events list here). Whatever it is (apparently 2 or 3 different things), it sometimes smells like chlorine, but other times rotten or burnt smelling. And it tends to incapacitate people and make them pass out in a way chlorine usually doesn't, but that sarin, for example, does. The agent(s) used are not identified, and worth more study. In that OPCW list, a yellow color does not come through in most cases, but in the bigger list of all similar claims, it tends to be the most common, which is a potential match for this December 22 attack. No one says anything else we've heard. The delivery weapon is not described. No smell is reported. Types of symptoms that proved fatal are unexplained. It's not clear if "they suffocated with damaged lungs (chlorine)" or "they had their nervous system disrupted and stopped breathing" (sarin) is the better description. But 7 dead, so quickly, would be quite unusual for chlorine, whereas it's to be expected with sarin. Extreme exposure will paralyze instantly and kill within seconds. Most fatalities will occur after some minutes of struggle, and occasionally they'll live longer, perhaps in a coma, before dying. If this had been sarin, for example: One might die instantly, four more within ten minutes, four others might struggle for up to 30 minutes, and one guy's nearly-survival was cancelled after 50 minutes. Statistically, maybe 12 others would stabilize and recover for some days, 22 others would be unaffected or recover within minutes to hours and be discharged that day or the next. That's a lot not to mention, but no one has asked, that I've noticed. If it were chlorine, maybe a group was pinned down under fire, and hit with a strong dispersion, waited too long too run, suffered massive damage, suffocated fairly quick with shredded and blood-filled lungs. But there should be others who got near as much and at least died after a longer struggle. But it sounds like the dying stopped after an hour at seven and everyone else pulled through. Large-scale chlorine deaths will hardly ever stop after an hour. They'll usually go on for days before there's a final toll. So unlikely this was chlorine or anything as simple. More likely, it was a nerve agent, or at least something more acutely fatal. Why would Syria not report this? It's possible they didn't even know or do the right tests, and it's possible they did know and concealed it for some reason, or told the OPCW and they neglected to mention that even as they argued against it. Daraya is next to Moadamiya, where the West Ghouta portion of the Aug. 21 chemical massacre was said to happen. The area including both towns was effectively a pocket at the time, cut off from other rebel areas in East Ghouta. If there were any false-flag shenanigans with sarin here, it would be from sarin held locally in Moadamiya and/or Daraya. 8-25-2013: Ahrafiya Sahnaya is a town just south of Daraya, given as the local of an incident on August 25, 2013. Actually it was at the sewage treatment plant between the two towns, so basically Daraya. For the third time since the Ghouta massacre on the 21st, rebels had hit Syrian soldiers in Ghouta with serious toxins - two were confirmed by the OPCW as sarin, including this one. A cylindrical canister was thrown with a catapult, around 7 or 8pm, released a "foul-smelling smoke" that caused decreased consciousness, nausea, AND it was an irritant, causing lung damage, eye irritation, besides miosis, fatigue, and hospital stays of almost a week. 2-15-2015: 18 months after that 8-25-2013 incident, just 1.8 km northwest of that spot, and still on the frontline, another group of soldiers was hit with a smoke weapon that had a strange smell "like burning nylon" and caused burning in the eyes and lungs. This incident is also confirmed by the OPCW as sarin (from the same report, and this case has some detail, also explored in this post here). No one died, but four soldiers suffered notable exposure ("blurred vision, teary eyes, runny nose, dizziness, headache, breathing difficulties, mild fatigue, and nausea. "), and one had severe impairment, lost consciousness, and may have come near dying. just where the 12-22-2012 attack happened is one of many things that's unclear about it. Was it the same then as in these later cases? Was that yellow gas foul-smelling and caustic? But whatever it was, in the end what matters more is who used it and what that says about their capabilities - technical and moral. There's been no suggestion the government gassed their own, but that would probably come up if pushed - but it seems probably rebels did this, and the very next day, someone decided to create the impression Syria was tossing poison gas, and not in Daraya but up in Homs. 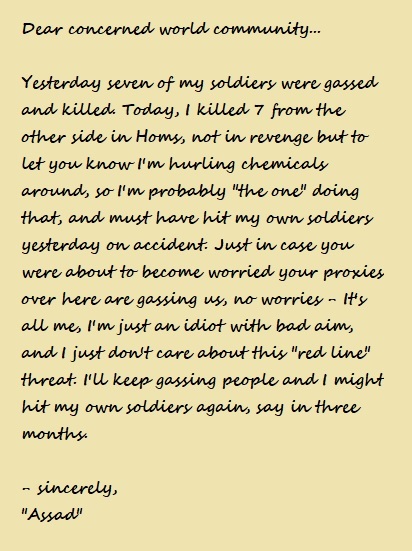 As I'll be adding there too, "Assad" may as well have left this note attached to that Homs attack. What Happened the Night of April 13/14 in Sheikh Maqsoud? Most people refer to this, as the page at A Closer Look on Syria does, as April 13, 2013. However, by the story it was actually about 3 am on April 14, in the sprawling Kurdish-majority Sheikh Maqsoud district of Aleppo. This is the first of two known incidents to employ the magical hand grenades apparently belonging to or used by Al-Qaeda affiliate Jabhat al-Nusra, and that was otherwise unknown and never-before-seen. In the other attack two weeks later in Saraqeb, they showed this grenade as responsible, but there were later suggestions that was shown as a similar example, not the exact weapon. But in this case, it's the one used, seen laying on the stairs (comparison below). So that story cannot be unwritten, in case anyone was tempted. "The Observatory (SOHR) said rebels captured a pro-government Sunni Muslim cleric in the fighting, killed him and then paraded his body through the neighborhood. The SANA state news said Seifeddine's body was "mutilated" after the "assassination." But the "FSA" and allies say the government is behind it, as Shelton heard. A Dr. Hassan, who treated the victims in Afrin, "said he thought the government was attempting to scare the Kurds in Sheikh Maqsoud — using a small attack with some kind of chemical — to prevent them from working again with the rebels." But not everyone agreed: "Others accuse the Free Syrian Army of trying to rope foreign powers into the conflict by feigning a chemical attack." It's not noted, but their Jabhat Al-Nusra allies might be doing the same. And, as Shelton noted, "The Syrian government has little to gain from speculation that chemical weapons are being used in Syria." Yasser Younes went to bed around midnight on April 13. When he woke up two days later, he was in a hospital, and his wife and two young children were dead. ...I spoke with the neighbors who had come in to help, and they’d found the two young boys were dead. The mother later died in hospital. So that was the whole family that was inside the house. The neighbors that came in to help them, they also fell ill. Most of them were in a coma also for a day or two. And then the next party to arrive were the Kurdish police and members of the YPG forces, the Kurdish militia forces that control the area, and many of them also fell ill, up ’til the next people arriving on the scene like three hours later. Most initial sources have 3 killed - two young boys and their mother, who would be Yasser's wife and kids. Some reports mentioned another woman had died, for 4 total. The December, 2013 UN final report heard "the alleged incident affected 21 persons and caused one death." That's clearly incomplete and apparently means one death in hospital (the mother: the boys were allegedly dead from the start). Most sources agree 20, 21, or 22 total patients were brought to the hospital in Afrin, including the 3-4 dead and thus 16-19 who survived the poison. Interestingly, the opposition VDC has 14 people listed as killed, for almost everyone reported as affected (VDC query: all chemical deaths April 13, and ACLOS). Beyond the first 2 women and 2 children, this adds another woman and 9 men, for 14 martyrs total. This division of death reports would be strange, if it weren't so common. Included in this list is our star witness: Yaser Younes Adult - Male, from Sheikh Maksoud, died 2013-04-13. Cause of Death: Chemical and toxic gases. 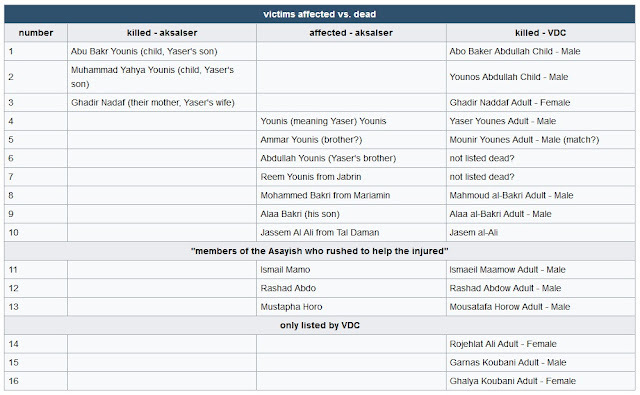 One possible argument is the VDC just goofed up and listed all the effected and dead as dead - and missed a couple, and got some names different, added a couple, etc. ... That sounds reasonable, and who would report these strangely-delayed deaths anyway? Best if they just vanish. consider: article on Tracy Shelton's work here "The most notable survivor was Yasser Younes, who remembered nothing but an explosion at 3 a.m. It was his wife and two children who had died. But Shelton could not interview him; Younes had returned to his home village. “He’d left to another village… and I was trying to get there, but I couldn’t get anyone to take me out there. I didn’t know the exact location” she recalls. Shelton had learned to be careful about accepting rides." That's smart, of course. Is "he went back to his home home town" here code for "he died, and the guy playing him retired the role to live his own life?" As far as I've seen, there are no images of Yasser specified. He might be one of the people in the video (none of whom seems to be in a coma, however), but no one says so. So far, I don't even know what he was supposed to look like. That could matter if there were ever some other image said to be of him to compare it to. And what about the seen victims? Two women are also shown, seeming at least to not be faking for the fun of it. One has apparent mucous bubbles from her nose, and seems paralyzed or dead at first, but later speaks to the camera. The other woman seems to have suffered a bad foot beating, and shows no obvious chemical signs other than laying still and not looking at the camera ... Did the new Islamist authorities have a go at her for some Sharia law crime like dressing wrong, or being married to a Kurd who crossed them? In retrospect, it shouldn;t be surorising if sarin somehow turned up in this incident, using the same weapon used later in an attack later confirmed to involve sarin. But at the time, it wasn't clear at all, and still, just how it was involved (if it was - likely) remains an open question. The Times of London report about a sarin attack in Aleppo (see Narwani): apparently people with the Syrian American Medical Society ("a team from “an American medical agency”) came to the Afrin hospital and took hair samples to have tested in US labs. (it seems SAMS also helped take stolen samples from the Khan al-Assal attack, after Islamists again overran the town, and sent hem to the US to confirm sarin in that case - ACLOS). The US was suddenly confident by late April to declare sarin was probably used (doubts aired by April 25 - McClatchy) A 14 June 2013 letter from the US government to the UN investigation alleged Syria's government used sarin "against the opposition in an attack on the Aleppo neighborhood of Sheik Maqsood on 13 April 2013," the UN report says. They were unable to verify. "The United Nations Mission sought to conduct fact-finding activities pertaining to this incident from the territory of a bordering country (in Turkey), having determined that such an investigation held the prospect of producing additional information. The United Nations Mission was ultimately unable to obtain any such information." (Turkey refused?) "In the absence of any further information, the United Nations Mission was unable to draw any conclusions pertaining to this alleged incident." (UN final report). No interviews, blood samples verified, nothing further. Textbook sarin: "they displayed symptoms of chemical exposure including foaming at the mouth, constricted pupils and difficulty breathing. They were treated using chemical weapons antidote Atropine, Dr Habash claims." (Daily Mail) It's almost like he read that right from a textbook, instead of actual events... except the foaming part. That can happen, but is not as standard or textbook as these guys think, and the shaving creak tricks really push it too far. None of the people seen as victims on video seem to have red eyes or bleeding noses, and they aren't vomiting. Are they stand-ins? The VDC heard: "at the beginning news were reporting that shelling was using white phosphoric material and then other sources said it is (Sarin Gas), news to be validated." This confusion is also seen with Adra, 3-24-13 (a few weeks earlier). There it seems bad translation was to blame - organophosphate (including sarin) comes out as (organic) phosphorous, taken as perhaps WP incendiary weapons. That's probably two early sarin reports. High-quality military-grade sarin appears and behaves just like water, including by being colorless and odorless. You'd see this produced by the USA, USSR during the Cold War, in Israeli labs, etc. But some military forces (Iraq, perhaps) and non-state groups (like Aum Shinrikyo) make their sarin in sloppier manner with varying impurities. Following the April KS attack, British and French officials stated the sarin used was a match to the sarin used by "Assad" in attacks in 2013, mainly meaning the 4-29-2013 incident in Saraqeb, detailed in a French intelligence report. But they would say it's the same in Ghouta and maybe all cases. Could be. No one has ever explicitly stated that any of the sarin found in the field after attacks is a match for the materials and processes surrendered by Syria. It was suggested. Some "consistent" chemical signatures or impurities have been cited, but not an exact overall recipe match. And even that could, possibly, be copied exactly by the right mad scientists, with or without inside knowledge of the Syrian program. Intel agencies will have samples of what Syria had, so any of their scientists could just "make some of that." But instead, they point to supposedly definitive matches between the sarin attacks. So if it turns out terrorists were behind all of those, the findings would be the same - each attack would carry the same signs it does, and that's the fingerprint of the Islamist scum behind it, not of the Syrian government. All the French spooks and their like really add is a repeated act of confidence in declaring each of those attacks as true-flag attacks by the government, instead of false-flag ones by the other side. Or, when Syrian soldiers are the targets (often), they'd say "fine, that's another stupid accident or maybe a false-flag by Assad to make the rebels look bad... it's not a straight-forward attack by "rebels," who "lack the capability" to whatever whatever..."
As I gather, impure sarin usually has a shorter shelf life, often an unpleasant smell, and may have varying colors. Wikipedia says “impure sarin can smell like mustard or burned rubber.” That's not a definitive source, but perhaps gives some idea... The main smell that emerges here, in the Syrian conflict, is a hard-to-place organic decay smell, perhaps like sulfur (arguably like mustard?) or "like burning nylon" as reported by gassed soldiers in February, 2015, confirmed by the OPCW to have been exposed to sarin. (Monitor post) It also might be the agent described in one attack as smelling like "dead animals or corpses." Consider how the December 2015 OPCW report (PDF, ACLOS posting) dismisses one case of possible impure sarin use, against Syrian soldiers on August 29, 2014 in Jobar, Damascus. It seems there were actually two attacks the same day, with the earlier one smelling like chlorine (per the 2 survivors from the group of 15) and the later one with more survivors/witnesses described as having a foul odor, like "dead animals or corpses" Both caused similar symptoms, including loss of consciousness: in the first case, some were incapacitated (unconscious? ), captured and executed, and most of the rest were killed or captured in the following clash. In the foul-smelling case, about 1/3 of the 33 affected soldiers passed out, though everyone escaped this time, assisting each other. The investigators decided the second incident was probably not sarin because... "the smell of sarin is most frequently described as a sweet smell of apple or pear." Is it? I have pure = no smell, impure = mustard, burned rubber, etc. That is vague, and probably quite incomplete. There's a person on a forum who says "Sarin gas smells like apple blossom or is odorless also have heard burnt plastic." The apple smell sounds like, perhaps, it's from almost pure sarin (apple blossom OR no odor seems the main smell range closer to purity), with burnt plastic being "also," maybe in a different context, from less pure material. Well, none of the attacks in Syria with confirmed sarin involvement has an apple/pear smell reported. Wherever there's sarin confirmed by the OPCW themselves (SEVEN of 8 cases, dated 3-19-13, 4-29-13, 8-21-13, 8-24-13, 8-25-13, 2-15-15, 4-4-17), it - or its release partner taken for it (see below) - smells foul, like organic rot, but strange, hard to place, maybe like sulfur, burning nylon (that's plastic), rotten eggs, etc. One exception is 3-30-17, with reports of no smell (add 11/29: these reports are not very trustworthy, seem very limited and close to militants, and report many unusual differences from the usual patterns). Likely sarin attacks on 3-19-13, 12-11/12-16 and many against Syrian soldiers (see events list for all I've catalogued) have the same kind of strange, foul, rotten odor described. It never smells fresh and fruity as they claim. So their dismissal is ill-founded, and that attack that smelled like decaying flesh might have used the same thing that usually comes with sarin - when it's checked for (they don't check in most cases, like this 8-29 case). The Sarin Attack Package: How Many Chemicals Involved? So, there are these incidents where sarin turns up. And it does. The phrase "Sarin-like substance" as used in reports seems unnecessarily confusing; "sarin-like" is so narrow they mean sarin or maybe 2 or 3 obscure compounds (I've seen clorosarin and some vx derivative given as examples), not any other likely poison. So, the connection between each of these things may not be as clear as it seems. It's possible the open-release smoke could be the visual effect for their fake sarin attack (maybe toxic as well to some degree, to help it blend in), while victims to be shown might be gassed with, say, carbon monoxide in some basement, while the actual sarin is saved for spiking samples and token doses for the people they send for testing. But in one case, at least as it seems, it must be all on one release of chemicals from a fired rocket. In Khan al-Assal, Aleppo, on March 19, 2013, one small chemical rocket was fired into a government-held area, believed to be by Jabhat Al-Nusra. A strange-smelling yellow-ish mist was released, causing irritation (skin itching), some sudden deaths, 20 killed all told, and tests and science showing it was impure "cottage industry" sarin, as everyone now agrees. Happening in a government-held area, none of that sort of trickery (by the opposition anyway) is possible. So as we wonder, let's note: this can all be done with one rocket and it can be just sarin with its own impurities, as it was in Khan al-Assal. It may or may not be that way across the board. So to the extent it may be different, let's give a name to the foul irritant(s) linked to these incidents. How about the foul irritant(s)? (considering there may be more than one used). This may also be the sarin, as it apparently was in Khan al-Assal. - Color: chlorine gas is basically yellow, slightly green tinted, and can appear quite pale or basically white when it's thin. A yellow gas (vapor, actually) is consistent with the sarin used in this war. If we ever got video of it, we might see a different hue, but verbally, they're hard to separate. Yellow gas" can go either way, depending. - Caustic: both chlorine and this serrin cause irritation, eye and lung damage - chlorine does this by turning into corrosive acid on contact with water. I'm not sure how the impure sarin/irritant(s) work. - Smell (but not foolproof): this is the key difference: chlorine smells like chlorine bleach, cleaning products, while the sarin stuff smells like awful, strange rot. Nonetheless, first reports from the Khan al-Assal attack specified a chlorine aroma, and that turned out to be sarin, with others recalling a sulfur-like stench. Those first reports could be confused from the sarin's similar color and strange smell, colored by prevalent worries at the time about all that chlorine Jabhat Al-Nusra had just seized nearby in December, 2012 (partly considered here). There was a December 22, 2012 chemical attack on Syrian soldiers in Jobar (ACLOS), using some yellow gas, initially seeming to be chlorine. Details (like smell and symptoms) are scarce, but the fact that 7 died, and all within an hour or less, would make it unusually deadly for chlorine. Instead, it could be the first appearance of the material(s) under study. As noted, two same-day attacks on soldiers 8-29-2014 - also in Jobar - had the same basic symptoms that are different from chlorine, possibly sarin, and involving widespread loss of consciousness. But they had different smells reported, and one was chlorine-like. Well, the same was reported in Khan al-Assal. Maybe those two soldiers formed a mistaken memory, like the more confident one thinking it was chlorine-like, and the other not remembering and following suit. However, there are other attacks in 2014 where more soldiers report a chlorine type smell, but also report diminished consciousness or passing out, which doesn't happen from chlorine, usually. (see events list, 7-11-2014, 9-10-2014, 1-8-2015) So even if it really did smell like chlorine, it almost surely isn't, even if it's also not sarin. Yet more clues there could be three or more chemicals involved in the entire attack-and-samples package. - Sarin-like effects: consistent symptoms (miosis, salivation/tears/nausea/vomiting - SLUDGE, paralysis, loss of consciousness, vision blurring/dimming, headache, fatigue, high and/or quick death toll (as with 12-22-2012), secondary contamination, etc. These will help illustrate chlorine is unlikely and/or that sarin is likely. Proceed to the events list, if you care to go over the stuff I'm going over (still in assembly - may be a near-complete list now). Some 29 incidents or clusters of incidents are assessed so far by the features under consideration (11 with verified or likely sarin involvement, 18 possible cases under consideration). 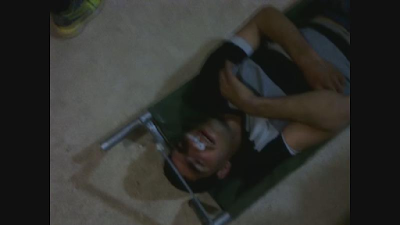 - Sarin Faking in Syria: token dose storytellers running the show? Sarin and the "Foul Irritant(s)"
This is part of a more organized study of the sarin used in Syrian attacks, or the sarin that turns up plus whatever else is used in those incidents ... the common features and patterns - is this all one chemical substance that would have to be impure sarin? Two used in conjunction? Three or more used in rotation? I won't be answering that with certainty, but perhaps with some analysis, a darn good guess might emerge. Below is a long, fairly complete list of incidents, with the incidents partly filled-in to start. first, verified sarin, then maybe cases: the same kind of clues appear to the degree this could be the same chemical(s) as one or another used in the cases where sarin does turn up. Sarin: Russian lab tests claimed that sarin was found, an impure, terrorist-made "cottage industry" sort. (but first mention I can find is July 9 - Reuters). There were initial worries of that. British scientists decided by March 24 from "samples" that it was tear gas, not sarin (Times of Israel). It seems rebels stole the samples after re-taking Khan al-Assal in June, turned them over to the US via Syrian-American Medical Society, and sarin was confirmed. UN report from Dec. 2013 didn't get that information and was left unable to confirm, when the Syrian government was unable to deliver the samples. They did conclude it was an organophosphate, possibly sarin. (ACLOS) By now UN investigators think it was sarin with the "same unique hallmarks" as that used in the Ghouta attack of 8-21-2013 (so both using government stocks, so probably the government - see here). patients had stayed between two days and two weeks in the hospitals. Miosis had been reported to last for several weeks." Notes: delivered in local Bashair-3 rocket, thought to be by JaN, impact around 7 am, In this case, no rebel fakery with alternate poisons used on some, etc. is plausible in a government-held area. In this case at least, it's all on the vapor that came out of one not-large rocket. Sarin: reported/suggested, seems coordinated with Khan al-Assal attack, verified as sarin use. <add 12/3>"Physiological samples collected in Syria -- including from Utaybah on March 19 and Sheikh Maqsood on April 13 -- were brought to the U.K. laboratory [Porton Down] for testing. The material tested positive for sarin, Arab and European diplomats said." (WSJ 8-23-2013)</end 12/3> UN final report notes state-lodged reports of this attack, none mentioning sarin. "The United Nations Mission did not receive sufficient or credible information in respect of" this and 8 other alleged attacks. Color: liquid agent said to be like water, but black - gas color not mentioned? Notes: alleged delivery by rocket - no visuals - preceding attacks back to at least 3-14 and into April noted in this same area: “The patients who arrive here have trouble breathing.Their pupils are constricted. Some are vomiting. They’ve lost their hearing, they cannot speak,their respiratory muscles have been inert. If we don’t give them immediate emergency treatment, death ensues.”The gist of this description is repeated in several others thenewspapermen say they had heard during their investigation. In all, they reported visiting eightmedical centres in the eastern part of the Ghouta region, in only two of which doctors said they had not seen patients apparently affected by chemical weapons. On a single day – 18 March2013 – doctors at Nashibayya recalled the admission of some 60 cases from the Otaiba front,five of which had terminated in death from suffocation." (Robinson) That last almost surely refers to March 19, but might raise a timeline issue. "Five (named) residents are reported dead and more than 60 injured, “[t]hey suffered from suffocation, respiratory failure, haemoptysis, severe drop in blood pressure, nervous and peripheral convulsions, myosis [sic]"
Notes: "The United Nations Mission sought to conduct fact-finding activities pertaining to this incident from the territory of a bordering country" (that means in Turkey) "having determined that such an investigation held the prospect of producing additional information. The United Nations Mission was ultimately unable to obtain any such information." (Turkey refused?) "In the absence of any further information, the United Nations Mission was unable to draw any conclusions pertaining to this alleged incident." (UN final report). No interviews, blood samples verified, nothing further. 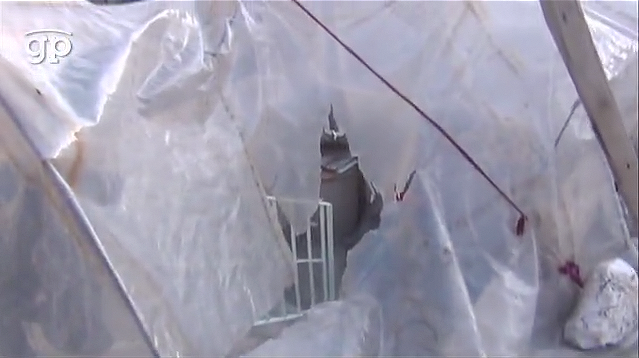 This attacks was allegedly by the same strange grenade linked to Jabhat al-Nusra also used in 4-29 attack below, dropped from a helicopter, into the open stairwell of an apartment building (as reported), seen laying in the stairwell. Initial reports: two women and 2 children died, with 16 (or 12?) others affected. Later records: another woman and 9 men also died, for 14 total. This division of death reports is strange. (ACLOS) One man who died has the same name as a supposed survivor who explained to opposition media how his wife and children died... happened in between Jobar attacks below. Sarin: (Wikipedia article) "In June 2013, the French government told the United Nations that it had evidence of a sarin attack in Jobar between 12 and 14 April. (p5) After the August 21st Ghouta chemical attack, French intelligence released a report that said samples from those attacks had confirmed the use of sarin. However, the U.N. fact-finding mission which investigated the alleged attack did not receive "sufficient or credible information" to support the allegation. (p10)" Le Monde report via Robinson: "It is in the urine of three Jobar casualties that Le Bouchet subsequently detects IMPA at levels in the range 270-1140 ng/ml." This is the primary substance created when sarin is broken down in the body. A report that only looked at IMPA results among Tokyo attack victims (apparently all of them, ranging from mild exposure to severe) - found IMPA levels ranging from 2 to 135 ng/ml. The reported Jobar range starts at twice the top of the Tokyo range, and stops at close to ten times that. Did they have people splashed with bucketfuls of liquid sarin over there? Or did they have people ingesting way too much IMPA? 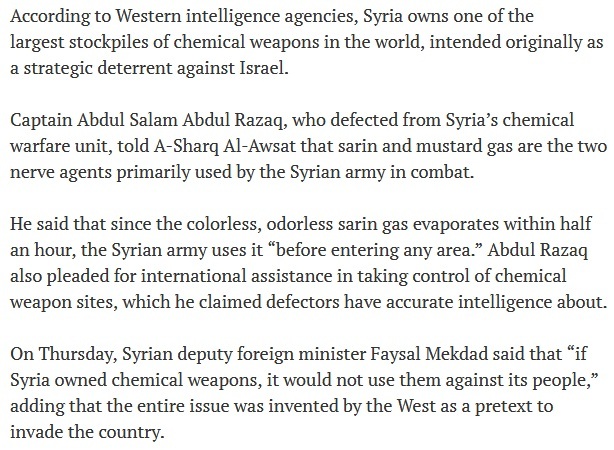 Because there's no mention of how much actual sarin was found, if any. Notes: UN and OPCW were able to confirm sarin in the dead woman's body, but not able to visit the site, and were somehow unable to interview any survivors. (UN final report: "Interviews with survivors: No survivors were interviewed."). Daylight attack. (time...) Delivery method confused and very unclear, with clashing stories (barrel bombs, plastic bags of powder, or as accepted, a special hand grenade seemingly designed for riot control, also used on 4-13, and linked to Jabhat al-Nusra, but here dropped from a helicopter in 3 cinderblocks, packed with 2 grenades each. 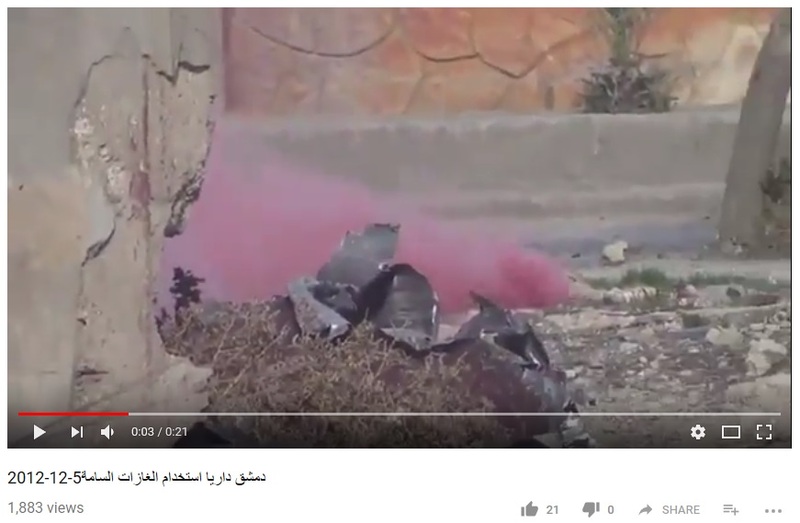 One video was provided but seems false, apparently showing an unrelated drop of white phosphorous chunks, so 3 drops in broad daylight went unrecorded (see link). OPCW and/or chemical weapons convention founded 16 years ago this day in the wake of the Tokyo sarin attack. Smell: "something like vinegar and rotten eggs" or "like cooking gas"
Notes: night time attacks, less clear support for any real open chemical release, and this is likely disconnected from many or most victims, who tend to display other and varied symptoms. Smell: "a foul and strange odour" "a badly smelling gas." Symptoms/treatment: "A group of 10 soldiers was evacuated in armoured personal vehicles to the field medical point with breathing difficulties, blurred vision and with strange symptoms not further specified. Four soldiers were severely affected. They were only partially conscious and not able to support themselves." 20 others less affected arrived later. The acute 4 "complained of a tight chest, wheezing and difficulty breathing" - 2 "had hypersalivation, red eyes with blurred vision and miosis. In addition, the patients were exhausted and disoriented." "The patients were washed and given two to three doses of atropine and HI-6 intravenously. One of the patients was reportedly unconscious and was transferred to the intensive care unit. The medical records state, however, that the patients were conscious and responsive with restricted pupils and bronchial spasms at the time of admission to the emergency room." "Two of the soldiers stayed in the hospital for eight days before release." "According to the senior doctor, the patients spent an average of seven days in the hospital." Smell: "A black, foul-smelling smoke ... A badly smelling gas ...a bizarre odour without any smoke." Symptoms and treatment: "laboured breathing, eye irritation, miosis, blurred vision and fatigue." "The most common signs and symptoms described to the United Nations Mission by patients included shortness of breath/laboured breathing (100 per cent), eye irritation (100 per cent), blurred vision (60 per cent), loss of consciousness (40 per cent), headache (40 per cent) and coughing (20 per cent)" "the patients were treated with atropine and HI-6. Eye drops and bronchial inhalers were administered. The patients were discharged from the hospital after 6 to 10 days." "No signs of secondary contamination were reported," even though it is sarin. Symptoms/treatment: "blurred vision, teary eyes, runny nose, dizziness, headache, breathing difficulties, mild fatigue, and nausea." lowered cholinesterase activity (quantified in OPCW report), reduced consciousness - one soldier lost consciousness. "All described a slow recovery and extreme fatigue. They also describe impaired vision, some expressing the sensation of photophobia while others describe a situation where they felt like it was dark around them. All of them described a rather severe head ache often located to the frontal aspect of the head. Some experienced the sensation of numbness in the limbs." Symptoms/treatment: "The injured had pinpoint pupils, extreme foaming from the mouth, in an unsteady condition, with muscle cramps, shivers and shaking. Most of them were unconscious. Some people’s hearts had slowed down to the point where we thought they were dead." "They were trembling, had extreme difficulty breathing, redness in their eyes; some had foam coming out of their mouth. People were going unconscious. Some of them started hallucinating, saying weird things, when they got to the hospital. "(HRW)Some cases of waking up about 7 hours later after seeming dead. Smell: (updated 2/27/18) JIM final report: "open sources reported that chlorine might also have been released, as indicated by the smell of bleach." I think I've seen the open sources but forget where. It may be presented as the only smell, which would be odd. Otherwise, it seems an "other" smell, with most accounts bring like: "it smelled like rotten food" "a foul smell ... a strange smell. I can’t put my finger on it." a "really disgusting odor," "stench." (Monitor) "there was a strong smell. The smell was really disgusting, but I am not able to compare it to anything else" (HRW) area-wide smell, along with area-wide fog = smelly fog? Notes: from news reports - no mention in OPCW report or lists provided by Syrian authorities. See Monitor analysis. Casualties: "a cloud of gas from bombs dropped by Assad’s forces on Adra, has spread to areas as far as the city of Douma. Fatalities are reported and 437 people suffer from symptoms like suffocation and exhaustion in the area." No deaths clearly recorded. smell: "a very bad odour"
caustic: burning eyes and throat, 100% reported breathing problems, etc. Symptoms: "nausea, vomiting, tearing, bronchial problems, flaccid paralysis and confusion. One patient was semi-conscious and two patients had bradycardia. They were given anti-vomit medication and fluids. Only one patient was given an unknown dose of atropine. ..." later group showed "breathing difficulties, the feeling of a tight chest, and burning eyes and throat, with some having miosis. According to a treating doctor, they were given intravenous fluids and oxygen, some received atropine, ..."
released. "All this suggests exposure to impure (less deadly) sarin or a similar nerve agent: low cholinesterase activity, miosis, nausea, headache, fatigue. Simple irritants don't cause this kind of symptom package. Notes: "The improvised device allegedly used and its effect did not indicate the use of chemical weapons," OPCW decided, so they skipped the dangerous site visit or testing the fragment. This refers to the device from which the toxic gas was said to emerge. They must mean the negative sarin tests suggesting no sarin residues would be found. But clealy, it was some kind of weaponized chemical ... with effects quite like sarin's. They note some inconsistencies, including a mixed DNA sample and "while a total of 16 whole blood samples were allegedly linked to the incident in Bahhariyeh by the Syrian Government, the DNA testing revealed that the 16 samples originated from only 9 individuals, if the mixed DNA sample was considered, or 8, if it was neglected." entrance, and incursion distance into the tunnel." a group of eight SAA soldiers "was assigned to either clear a tunnel or breach an area of houses where they discovered a tunnel. This tunnel was the scene of the ensuing incident." Only two commanders at the head of things were interviewed. "One of the interviewees reported to have been inside the tunnel and closer to the alleged release and the other reported to have been outside the tunnel." There was a firefight, some unseen device tossed, a dull blast. "The smell was described as being very disagreeable, like that of corpses or rotting flesh. ""All eight team members experienced immediate symptoms described by both interviewees as nausea, sore throat, headache, breathing difficulty, eye irritation, and decreased level of consciousness." supportive care: "including oxygen, intravenous fluids, and medications. Blood samples were taken and diagnoses were nonspecific. The interviewees stated that the casualties were discharged from the hospital a few days following the incident, in good health." Note: dismissed as unclear by OPCW, as possible attack with an unknown chemical and possibly an industrial accident or side-effect of conventional weapon use. 5 of 6 examined cases from 2014-2015 were classed this way (8-29-14, 4-16-14, 7-11-14, 9-10-14, 1-8-15). Only the one involving sarin on 2-15-15 classes as clear CW incident, except they can't say for sure when and how the soldiers were exposed. URS1798) No word on or from any survivors. Sarin: suggested by very high death toll, except that much is unknown about that. Seems didn't have time to put gas masks on (instant death), but that could be staged (for unclear reasons). Some kind of whitish smoke was seen pouring across the valley. Symptoms (or clinical signs, observed from low quality video): sometimes nothing clear, some coughing blood, some perhaps showing body contortion, and several with what seems like dark smoke stains on their faces (the most common feature). Some appear wounded or even killed in battle, but most appear uninjured. Symptoms: include "coughing, tearing of the eyes, suffocation, nausea, and unconsciousness." (OPCW Dec. 2015 report) chlorine does not usually cause decreased consciousness. Note: dismissed as unclear by OPCW, as possible attack with an unknown chemical and possibly an industrial accident or side-effect of conventional weapon use. 5 of 6 examined cases from 2014-2015 were classed this way (8-29-14, 4-16-14, 7-11-14, 9-10-14, 1-8-15). Only the one verified as involving sarin 2-15-15 classes as clear CW incident, except they can't say when and how the soldiers were exposed. most as being similar to rotting flesh." "...a particular odour which some compared to the smell of dead animals or corpses and others reported as similar to rotten eggs. Still others reported that they had never experienced anything similar before and couldn’t compare the smell to anything." intravenous fluids and in some cases inhalation of ß2 agonists such as salbutamol. rest for a number of days." the rendering of first-aid, transport or definitive treatment in hospital. note: this "occurred around 18:00" as "a group of about 35 soldiers from the Syrian Arab Army were preparing to advance towards an area held by an opposition group." chlorine is at the far end of the scale "low probability." Rot and cleaning products smell quite diferent, if not opposite. Diborane (Wikipedia) is their most likely, by smell. It has no known use as a weapon, but is used as a rocket propellant. They're proposing a random accident of fuel combustion or whatever could be to blame for incapacitating soldiers in the middle of a fight. Twice in a day? and in how many other similar cases? "As for sarin (GB) or other organic phosphoric compounds (OPs), the smell would not be consistent with the unpleasant signature of rotting corpses or eggs, since the smell of sarin is most frequently described as a sweet smell of apple or pear." Most frequently where? How frequent is this smell? Documented sarin cases in Syria as related above, citing OPCW findings: none features a light, fruity smell. Rather, it's described as foul, rotten, like sulfur, burning nylon, etc. if not usually "like rotting flesh." Also they're fairly sure there would be secondary contamination if it were sarin, but 8-24 and 8-25-2013 (see above) shows that's not universal in confirmed sarin attacks. Used Against: SAA soldiers. none directly killed, but some incapacitated soldiers reportedly captured and killed. "The FFM identified a notable discrepancy in the prevailing narrative referring to an additional incident" Two casualties agreed on an incident "around 16:00 on the same day." (app. 2 hours earlier than the above) as a smaller group "of around 15 soldiers of the Syrian Arab Army were confronting enemies in Jober when a device allegedly filled with what was described by these two soldiers as a chlorine-like gas was thrown at the group." Like by color? Smell? A military report (Report of Colonel Commander of Brigade 358 for Special Missions on the Exposure of a Group of Soldiers from the Brigade to the Inhalation of Toxic Gases”) is cited for "the smell of the explosion (reported as chlorine-like, according to witnesses)." The same was reported initially with the Khan al-Assal attack of 3-19-2013, and it wound up being sarin. "(c) The described chemical incident incapacitated some of the group, apparently preventing them from escaping the scene and ultimately leading to their capture and execution." Chlorine is not incapacitating. See here. "There then followed a combat/fire fight with opposition groups that led to other fatalities and the capture of other members of the group. The two soldiers interviewed by the FFM were the only ones who managed to flee the scene." Notes: This was an important event to the Syrians: UN report: "an agreement was reached between the authorities of the Syrian Arab Republic and the FFM to focus initially on the incident reported to have taken place on 29 August 2014 in Jober. The fact that this particular event involved the highest number of casualties from among all of the incidents described in Note Verbale 150 served as the basis for this agreement. " They sent much info, including "a brief description of the device (a locally made device), the firing point of devices (according tothe firing sound)," but apprently had two events mixed into one? Or was only referring to one? "The authorities of the Syrian Arab Republic did provide footage from an open source which purported to describe the aftermath of this incident" (which of the two?) Looking at the two stories apparently as one, which Syria seems to have presented it as, "The FFM was not able to identify a cohesive narrative ..."
FFM asked to re-interview one witness "to clarify points of the narrative," apparently being time: was it at 1800 or 1600? Or, which story did his story fit with, or were there two, or what? It seems they didn't get to re-interview him, and things were left unclear. Dismissed as unclear by OPCW, as possible attack with an unknown chemical and possibly an industrial accident or side-effect of conventional weapon use. Used Against: Shia pro-government local militia fighters: Popular Committees/NDF/"Shabiha"
Smell: "a smell consistent with “chlorine and cleaning detergents” but "Symptoms included decreased level of consciousness and were otherwise consistent with acute, nonspecific irritation of the mucosa and respiratory tract." chlorine does not usually cause decreased consciousness. Note: dismissed as unclear by OPCW, as possible attack with an unknown chemical and possibly an industrial accident or side-effect of conventional weapon use. 5 of 6 examined cases from 2014-2015 were classed this way (8-29-14, 4-16-14, 7-11-14, 9-10-14, 1-8-15). "Witnesses described having intercepted radio communications alerting them to the possibility of toxic chemical attacks. Such communications were also broadcast via the mosque." Notes: Reported as a chlorine attack with the standard tank seen, the usual smell clearly reported, etc. but ... reported to be sarin hiding under the reported chlorine - just before sarin did re-emerge in the same area, somewhat hiding under chlorine. Dr. Shajul Islam might have been onto something there. The famous fatality Dr. Darwish never did look like a chlorine victim. Symptoms: miosis, spasms, weakness, loss of consciousness, "excessive salivation," breathing problems, red eyes, "restlessness" - secondary contamination reported.